London is Europe’s busiest city for private aviation, and Southend airport (some 65 km east of London) has become the latest airport to tap into the market. It has announced that the “Stobart Jet Centre” will open in November. Stobart – the owners of Southend airport – hope it will cater for 5,000 private flights per year by 2022, and will be open 24/7 for 364 days a year. That means plane noise on any night for nearby residents, but Stobart see the possibility of flying any time of the night as a big draw for London’s private jet users. [That is, if they can be bothered to travel all the way out to Southend …] And it will be cheap. Stobart says it is “…confident that London Southend Airport will become a refreshing, hassle-free alternative to London’s current, crowded private aviation terminals…. The airport is 42 miles from the heart of London’s West End, while chauffeur transfers are under an hour by road to central London. There are also helicopter transfers to and from Canary Wharf or Battersea Heliport.” London Southend said that with no slot restrictions, it will be able to offer faster departure routes outside of London airspace, reducing flight times. There are restrictions on night flights at Southend, to protect residents from night noise. But these apply to commercial flights, not private jets. Three bidders have emerged to buy a controlling interest in Stobart Air, the airline behind plans for scheduled flights from Carlisle Airport. The News & Star reported in December that Stobart Group and the investment house Invesco were looking to sell their 85 per cent stake in the airline, which operates Aer Lingus Regional services. Press reports in Ireland suggest that the Dublin-based Aviation Finance Company has tabled a bid, as has Stobart Air’s management led by its chief executive Sean Brogan. And it is understood that Stobart Group is considering merging Stobart Air with the Irish carrier CityJet in a move that could create one of Europe’s largest regional airlines. It is not clear what, if any, impact a change of ownership at Stobart Air would have on plans for flights from Carlisle. The Government confirmed in November that proposed routes from Carlisle to London Southend, Belfast and Dublin are among five to share a £7m start-up subsidy for new services from regional airports. Stobart Group owns Carlisle and Southend airports, giving a strong incentive for a Stobart-owned airline to operate services between them. That would no longer be the case if the company sold its stake. At present, Stobart Group says, “developments at Carlisle airport are continuing as before”. Chief executive Andrew Tinkler has said that scheduled flights from Carlisle could start this year. A new 2.5 megawatt ‘Solar Photovoltaic Array’ has been built by Stobart Developments on 3.2 hectares of unused grassland at the north of the Southend airport site. The airport hopes around 20% of its annual electricity requirement will now be generated by the panels. There will be over 9,500 panels, “mounted on 3 metre high steel frames supported on approximately 2600 piles across 37 rows. The layout of the panels has been specially designed to prevent reflective glare affecting approaching aircraft and the air traffic control tower.” There had previously been concerns about glare from the panels affecting pilots. There is now also to be a solar farm under Bournemouth Airport’s flight path, about 720 metres to the west of the airport. It has been approved by planners at East Dorset District Council. Questions were initially raised over air passengers’ safety when the proposals were revealed, due to the glare and reflection on sunny days. The airport had objected to it, due to solar glare, saying “the effect on operations is pronounced and severe throughout the year, making aircraft operations unsafe if the development was to go ahead.” However, their complaints were then conditionally withdrawn after a “glint and glare” study was done. Southend Airport is planning to build a solar farm on part of its land, which cannot be used for much else as it is in a flood plain area. This is land to the north of the main terminal. The plan is for 12,000 solar panels in 41 rows, spread over almost 8 acres of grassland. – and providing up to 20% of the airport’s electricity on some days. Council planners are recommending approval for the plans, even though councillors rejected an almost identical plan a few months ago. As the panels are on frames, they can be above the flood level, and the transformer building would be sited outside the flood plain. The EA objected to the previous application because it would lay on a flood plain, and has submitted a provisional objection this time on the same grounds. Airport officials say the panels will not interfere with the airport’s operations. The plan is that the panels will not disturb nearby badger setts. Rochford’s planning committee is due to vote on the application – on Thursday 20th May. There are still government subsidies for this sort of solar farm, as it is not taking up valuable agricultural land. Some other airports in sunnier countries have solar farms. Southend Airport’s parent company Stobart Group has revealed earnings from its aviation division fell from £400,000 to £100,000 last year. Passenger numbers grew 38% to over one million and a newly completed terminal extension raised its capacity to 5 million. To stimulate further growth, the airport has entered into a new partnership with low-cost carrier Flybe to launch a new airline, Stobart Air, which will use two Flybe aircraft to launch 6 new routes to Europe (Antwerp, Caen, Groningen, Maastricht, Munster and Rennes). Stobart said “..there is still work to be done to improve profitability with renewed focus on revenue per passenger and controlling costs.” The company said it was continuing to develop plans for Carlisle Lake District Airport, but these remain dogged by ongoing challenges around planning. Southend airport had 9,476 air transport movements in 2013, which was an increase of 30.4% on 2012, and it had 969,940 passengers, an increase of 57.2% over 2012. So 57% more passengers in 2013 but 75% fall in profit. Aviation is an odd industry. The local paper has revealed that Southend Airport has been discharging de-icer into Prittle Brook for more than 2 winters. The airport’s owner, the Stobart Group, has only now applied for a permit from the Environment Agency to discharge up to 79,188 gallons (360 cubic metres) of “trade effluent consisting of deicer”into the waterway every day. Stobart said the application is for surface water running off in the winter. The local Castle Point Wildlife Group are concerned that even if diluted, the de-icer may harm the natural environment. John Fuller, coordinator of the South East Essex Friends of the Earth, said: “We are very concerned about this in case it has implications on human health. We understand the EA deems it within tolerable limits….. The fact that it has been going on for 2 years shows the controls on the airport are woefully inadequate.” Local fishermen are concerned about the potential pollution of their catches, which are not tested for this sort of pollution. Stobart claim the Environment Agency has monitored the situation and found “little or no impact on water courses and wildlife.” The EA will take comments on this application till 22nd May. Stobart Group’s aviation division has suffered another blow, just a month after a High Court judge quashed its plans for Carlisle Airport. Flybe and easyJet have axed routes from Stobart’s Southend Airport. Flybe has cancelled flights to Cologne after only one week in response to an announcement from Ryanair that it is launching a route from nearby Stansted to Cologne. Meanwhile, easyJet has reduced the number of planes based at Southend from 4 to 3, scrapping flights to Krakow and winter services to Jersey and Palma, Majorca. Flybe’s routes from Southend are operated by Stobart Air’s aircraft under a franchising agreement. Flybe’s other new routes to Rennes and Caen, Munster, Antwerp and Groningen will continue. Stobart had hoped the new routes would carry 200,000 passengers in 2015, rising to 700,000 by 2017. Stobart’s plans for Carlisle Airport had envisaged daily flights to Southend and Dublin, but that is held up by the legal challenges though Stobart will submit another planning application. Southend Airport is now expecting to carry 2 million passengers by 2015 – five years earlier than originally planned. It had said, only two months earlier, that it would reach 2 million passengers per year by 2020. Passenger numbers at Southend were 970,000 in 2013 and are predicted to be 1.3 million this year. By contrast, before the arrival of easyJet, there were some 42,000 passengers in 2011. A £10m extension to the airport terminal was formally opened by the Transport Secretary Patrick McLoughlin in February 2014. The extension marks the end of a £120m revamp by the Stobart Group, which bought the airport in 2008. The growth in numbers of flights has caused a lot more noise for local residents now finding themselves over-flown. The local community group, SAEN, say they will continue to oppose the airport’s expansion plans, due to the noise nuisance – and particularly if the airport tries to alter its operating hours. There is also more road congestion, as the airport is only served by one small road. The extension is due to open to passengers, with a bigger departure lounge, more check-in desks, revamped baggage reclaim facilities, a new arrivals area and five more plane stands have been built. The airport said the larger terminal would “ensure high levels of service” as passenger numbers grow. The airport claims: “the project could eventually create about 300 jobs due to more planes being based in Southend.” The first phase of the extension, housing the arrivals areas, opened in June last year. Retail and catering facilities are also due to be expanded in the future. 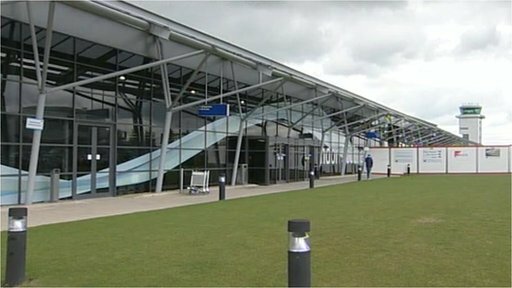 The airport was bought by Stobart Group in 2008 and spent £100m on its revamp before it opened in February 2012. In 2013 the airport handled nearly a million travellers, but has said it hoped to increase passenger numbers to two million a year by 2020. 1.1.2014 easyJet has scrapped flights to Edinburgh and Newquay from Southend. It is also scaling back its trips to Jersey and will now only operate 4 a week. This comes after a decision by easyJet in August to scrap flights to Belfast, on January 5. The company would not reveal the reasons why but said they will “focus the flying schedule there on the routes with the greatest demand.” The airport said “This summer they added an additional aircraft to the base and have consistently expanded the number of destinations on offer from Southend. We look forward to continuing and growing this relationship.” Flights to Edinburgh have been running since May, and the last will be in June. “About 5% of our passengers flying in and out of Southend in 2013 used the Edinburgh services.” The Newquay route was launched in June 2013 and carried almost 8,000 passengers in the summer. In October, easyJet’s UK commercial manager, Hugh Aitken, said in an extra flight would be added in August 2014. Easyjet runs 25 flights to Edinburgh from other London airports. It has also recently started flying from Southend to Tenerife. Click here to view full story …..
EasyJet will drop its service from Belfast International to Southend from 6th January 2014. The removal of the route, billed as a twice-daily commuter service to London via the Essex seaside town, comes as the airline marks 15 years of flying from Belfast International. EasyJet entered a 10-year partnership with Stobart Group to start flights to Belfast and other destinations from April 2012. The Belfast route was marketed at commuters from Belfast to London who wished to avoid the hectic nature of the bigger London airports. Trains from a new station in Southend would reach central London in an hour. It cannot have been profitable. Click here to view full story …. but EasyJet is adding new flights from Belfast International to Jersey and Bordeaux. Details. 19.2.2013 The airport applied on 3rd January 2013 for a second extension of the terminal building. Work is still going on to extend the terminal by 90 metres, in work applied for last year. This second application – which is expanding the airport by a process of “creep” – would be (it is claimed) for immigration checks, and would be 10 metres by 80 metres in size. There is currently no deadline date for comments, so these can still be submitted. The documents are difficult to access on the Rochford Borough Council website, with little effort being made to ensure the public can see and understand them. The application number is 12/00751/FUL and information can be see at terminal expansion application. One page of the main document can be seen at Second southend terminal application Jan 2013 By extending the terminal in smaller stages, the airport is endeavouring to avoid the environmental checks that would be necessary for a larger application. See under Southend Airport News for more on the terminal. EasyJet started its flights from Southend on 2nd April 2012. They say there will be 70 easyJet flights per week. They will start a ski flight to Geneva at the end of the year. The easyJet launch programme includes family destinations, city breaks and a few business routes. There will be 12 destinations, Alicante, Amsterdam, Barcelona, Berlin, Faro, Ibiza, Jersey, Majorca (Palma) and Malaga. There will also be two routes to Ireland by Aer Lingus, to Waterford and to Dublin. Geneva will commence from December and Venice from February 2013. Amsterdam is the most popular route to and from Southend. EasyJet say Southend is their 11th UK base, bringing 3 new A319s and “over 150 employees” to the airport. They expect over 800,000 passengers in the first year. 6.12.2012 easyJet has announced that it will be further expanding its route offering from Southend Airport with a new service to Newquay, from Summer 2013. The new 3 times weekly service which departs on Tuesdays, Thursdays and Saturdays is expected to attract almost 10,000 passengers each year with the inaugural flight taking off from Southend Airport on 20 June 2013. It talks about this fast connection to the “English Riviera” and its great beaches, restaurants and attractions. Fares start from £30.99 per person (including taxes) based on two passengers flying on the same booking. “We are sure Newquay is going to prove popular with Essex travellers for both short breaks and longer staycations – not just for its surfing, but also for the simple and easy access it provides to the much admired Cornish coast. EasyJet has also announced new services to Krakow and Berlin launching June,2013 bringing the number of routes served from London Southend Airport to 14. Click here to view full article …..
Popular – easyJet has done well in its first month at Southend AIR passengers are choosing to fly to and from Southend’s revamped airport rather than Stansted, new figures suggest. Statistics published by the CAA show 41,600 people flew via the airport during the first month of easyJet flights. Passenger numbers for Stansted fell by more than 21,300 for the same destinations in April. Alastair Welch, Southend Airport’s managing director, welcomed the figures, saying they meant about 70% of seats had been filled. Because the Southend and Stansted operations are so different, direct comparisons are impossible, but the first month’s figures seem to suggest Southend has taken a large bite out of Stansted’s flights to the same destinations. Details …..
A new rail link between Southend Airport and London’s Liverpool Street station was officially opened by Theresa Villiers, the Transport Minister, on 21st September. This has been built to benefit from the 2012 Olympics. The station eliminates the former need to change at Rochford to access the airport by train. Trains will also stop at Stratford, the main Olympic site. The journey time to central London will be 53 minutes, around 8 minutes longer than the journey to London from Stansted Airport. The time from Southend to Stratford is 44 minutes. From April 2012 there will be 70 new easyJet flights per week to and from European destinations. Southend airport also confirmed in September that a new German carrier, Jetisfaction, will soon offer regular services to and from Germany. http://www.jetisfaction.com/en/scheduled-flights/flight-booking/ It seems to just have occasional flights from Southend to Munster, starting from November. WORK on Southend Airport’s new passenger terminal is nearing completion. 2.8.2011 (Southend Echo) The £10 million building will be completed in October and is taking shape opposite the new railway station. Airport bosses say the terminal has been designed to give customers the shortest possible journey from check-in to plane to ease their experience. Jonathan Rayner said it will take less than 15 minutes for people getting off the plane to be at the station platform. permission to apply for a Judicial Review is being lodged with the High Court. is nearing completion. The new control tower is due to be operational by February. June at which SAEN understand that a possible night flight ban may be discussed. 24/7 holding off the chainsaws and building a small but sturdy activist centre. in, by Secretary of State. Click here to view full story …..
is to prevent Southend Council granting planning permission without his authorisation. 53,000 and the definition of night-time for flights will be from 23:00 to 06:30.
volumes of freight due to its location and the pressure on the local road network. achievement of certain aspects of the airport’s development (the ‘Acquisition’). 09/09/2009 – Yellow Advertiser – Letters: A rise in value, are you sure? 20/07/2009 – Echo – Where’s evidence to justify taking photos? 02/06/2009 – Echo – Who will buy quiet planes? 20/05/2009 – Yellow Advertiser – Letters: Just what is Stobart planning? 08/05/2009 – Echo – Is port link real reason for buying our airport? 10/04/2009 – Echo – We’re told to recycle, so why expand airport? 24/03/2009 – Leigh & Westcliff Times – Fly by nights! 22/10/2008 – Echo – Do we really ned to expand the airport?